Aims and Objectives: To compare the effect for fracture resistance of different coronally extended post length with two different post materials. Materials and Methods: One hundred and sixty endodontically treated maxillary central incisors embedded in acrylic resin with decoronated root portion were taken for the study. The postspaces were prepared according to standard protocol. The samples were divided into two groups according to the post material: glass-fiber post and Quartz fiber post. These groups were further subdivided on the basis of coronal extension of 4 and 6 mm for glass fiber and Quartz fiber posts, respectively. The posts were then luted with dual-polymerizing resin cement followed by core buildup. Samples were subjected to increasing compressive oblique load until fracture occurred in a universal testing machine. Data were analyzed with one-way ANOVA and independent Student's t-test. Analysis was done using SPSS version 15 (SPSS Inc., Chicago, IL, USA) Windows software program. Results: Glass fiber post with coronal extension of 4 mm (182.8 N) showed better results than with 6-mm length (124.1 N). Similarly, in quartz fiber posts group, 4-mm postlength (314 N) was better when compared with 6 mm (160 N). The 4-mm coronal extension of quartz fiber post displayed superior fracture resistance. Conclusions: Glass fiber posts showed better fracture resistance than Quartz fiber posts. 4-mm coronal length showed more fracture resistance than 6 mm. The prognosis of endodontically treated teeth depends not only on the success of the endodontic treatment, but also on the type of reconstruction. Endodontically treated teeth have a significant difference in physical and mechanical properties compared to that of vital teeth. The likelihood of a pulpless tooth surviving is directly related to the quantity and quality of the remaining dental tissue. Lack of moisture content due to the removal of pulp contributes to decrease in tooth resiliency and increase in susceptibility to fracture. The fracture resistance of endodontically treated teeth can be increased using intraradicular dowels. These posts act by distributing torquing forces within the radicular dentin along the root length and also promote retention to the final restoration. The chemical composition is compatible with that of Bis-GMA monomer, present in the adhesive systems and resinous cements. The fiber glass posts are translucent, contributing to the esthetic qualities of tooth-colored restorations. Malquarti G and Ferrari M et al. observed that, when the postlength is equal to half of the root length, the root behavior was similar to that of roots that were prepared up to two-thirds of their length., Clavijo VGR et al. compared the fracture resistance of cast metal cores and glass fiber posts and observed that longer cast metal cores presented greater fracture resistance than shorter cast metal cores, whereas glass fiber posts with different lengths showed a similar behavior. For the better preservation of dental structure, shorter postlength allows a larger amount of root canal filling material to be preserved in the apical region. It is extremely important because the apex is an area of greater anatomical complexity, with a large number of lateral and accessory canals. Some retrospective studies of fiber-reinforced posts have reported good clinical success for up to 6 years. It has been verified in in vitro studies that the reduced stiffness of certain fiber-reinforced posts can be beneficial for preventing catastrophic root fracture. Flexure of a fiber-reinforced post may result in greater stress on the composite resin core, causing premature failure of the core restoration., The availability of 2.0 mm of coronal tooth structure between the tooth preparation finish line and the tooth/core junction enhances fracture resistance. The extension of coronal tooth structure provides the greatest influence in terms of resistance and retention form for a crown. Of several dowel materials, there is paucity in literature regarding the comparison of glass and Quartz fiber posts with different coronal extension sustaining fractures. Hence, the purpose of this study was to compare and evaluate the fracture resistance of two different coronally extended posts of two different dowel materials with different lengths. One hundred and sixty freshly extracted human maxillary central incisors teeth were collected and stored in a solution of 10% formalin and thymol crystals, for <3 months at room temperature until the procedure for fabrication of samples was begun. Now, these 160 acrylic resin blocks were divided into two groups, namely Group A (80), glass fiber posts (Tenax Fiber Trans Post, TFT 11, Coltène/Whaledent, Cuyahoga Falls, OH, USA) and Group B (80), Quartz Fiber posts (UniCore Post size 2, Ultradent, Salt Lake. City, UT, USA) which were further subdivided into two subgroups, each having forty in number, A1 and B1, which include 4 mm of coronal extension of post and A2 and B2 which include 6 mm of coronal extension of post. To accommodate equal number of samples (40) in each group, 160 samples were taken. Before starting the study, the necessary approval was obtained from the local Ethical Committee (Letter no: PDCH/32/2012). The selected teeth were approximately of similar dimensions with completely formed, straight, and sound roots having a single canal, free from caries, restorations, any previous endodontic treatment, and cracks. Teeth with caries or restoration were excluded from the study. The teeth were evaluated with naked eye as well as using ×2 magnification lens, as it might affect their fracture resistance to applied forces. Hard- and soft-tissue deposits were removed using ultrasonic (NSK, Westborough, MA) scaler. The coronal portions of each tooth were sectioned perpendicular to its long axis at the cementoenamel junction with the use of a double-sized diamond disc (DC-31; Dia Burs, Mani Inc, Tochigi, Japan) in a slow-speed hand piece. Continuous copious water irrigation was done to overcome the heat which is dissipated during sectioning of the tooth. Root canal treatment was performed by following standard protocol. 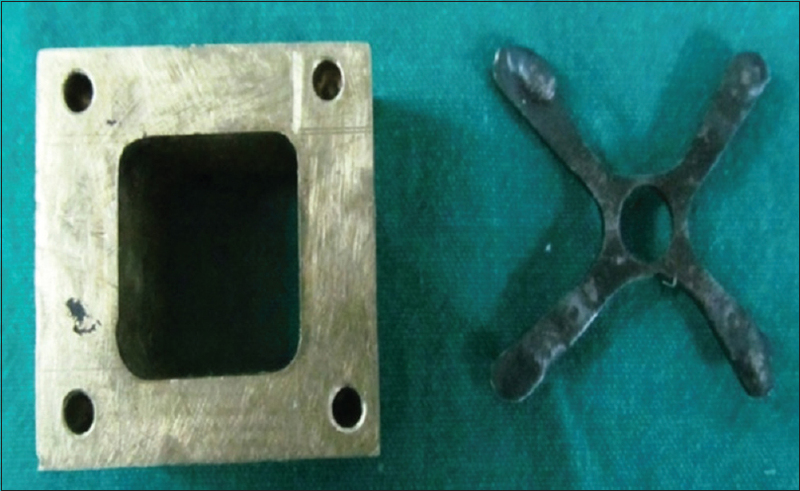 A hollow square brass metal mold of 20 mm × 20 mm × 20 mm dimensions with four orientation holes on the top surface of brass mold, at four corners, was fabricated. To standardize the tooth position at the center of the brass mold, a crosshead apparatus was made [Figure 1]. This crosshead apparatus had four vertical projections of 1 mm × 1 mm × 1 mm at four corners. At the center of the crosshead apparatus, a hole of 6 mm in diameter was created to stabilize the position of decoronated tooth at the center of the brass mold. After petroleum jelly (Vaseline, Hindustan lever Ltd., India) was applied, autopolymerizing acrylic resin (DPI-RR, The Bombay Burmah Corporation, Mumbai, India) was manipulated according to the manufacturer's instructions and packed into the mold. Then, crosshead apparatus was positioned onto the brass mold to place the decoronated tooth at the center of acrylic block, thereby standardizing the placement at the center of the block. Similarly, 160 acrylic resin blocks were made with embedded decoronated teeth in it. Prior to dowel space preparation, samples were immersed in distilled water and maintained at 37°C (±2°C) for 36 h. The dowel space preparation was carried out by attaching a slow-speed contra-angle handpiece (NSK, Nakanishi Dental Mfg. Co. Ltd., Japan) with the respective postdrill systems for glass fiber posts and Quartz fiber posts (Tenax Fiber Trans drills, TED11, Coltène/Whaledent, Cuyahoga Falls, OH, USA, and UniCore drill, Ultradent; Salt Lake City, UT, USA) as per the manufacturer's recommendation to the dental surveyor (Jelenko, J. F. Jelenko and Co., Inc., NY, USA). After postspace preparation, the postspaces were rinsed with 0.2% chlorhexidine digluconate solution and dried with absorbent paper points. The dentin of decoronated teeth was then etched with 37% phosphoric acid (3M™ ESPE™ Dental Products, USA) for 15 s, followed by drying with a three-way syringe to make the surface frosty in appearance. Then, dual-polymerizing bonding agent (Adper Single Bond Plus, 3M ESPE, St. Paul, MN, USA) was applied as a single coat with applicator tip for 30 s; the excess bonding agent was removed using absorbent paper points. It was later light cured using light-curing unit (Quartz Tungsten Halogen, SmartLite, Dentsply, Milford), according to the manufacturer's recommendation. The dual-polymerizing resin-luting material (ParaCore-Coltene/WhaledentAG, Feldwiesenstr, Switzerland) with the tip attached at its one end, with uniform pressure, was injected into the postspace, and Lentulo Spiral (Dentsply/Caulk, Milford, Del) was used to spread the material. Post held by tweezers (API, AshooSons, New Delhi, India) was slowly seated into the postspace, followed by removal of the excess material. It was held under finger pressure for 20 s. The same procedure was followed for Quartz fiber post. The cement was light polymerized for 30 s on each surface (labial, palatal, mesial, and distal), resulting in a 2-min light polymerization cycle and allowed to set for 5 min. Then, with the help of a measuring scale, measurements were made from the decoronated portion of tooth structure using lead pencil at lengths of 4 and 6 mm on the post. Using this procedure, 160 samples each of glass fiber posts and Quartz fiber posts with coronal extension of 4 and 6 mm in length were made, respectively. The lengths exceeding the desired values were trimmed with a double-sided wheel-shaped diamond point (WR-13C; Dia Burs, Mani Inc. Tochigi, Japan) using slow-speed handpiece with water spray. After etching and bonding of the decoronated tooth as per the manufacturer's instruction, core buildup was done using matrix with composite resin (Filtek Z250, 3M ESPE, St. Paul, MN, USA) by incremental technique. The matrix was fabricated with a soft thermoplastic sheet of 0.9 mm (5” × 5” Soft Tray Sheets/DE Platten/FR Plaque/NL Sheets Ultradent Products Inc. South Jordan, Utah, USA) in the vacuum for Med-Pressure molding device (BioStar® Scheu-Dental GmbH, Iserlohn, Germany) on a sound tooth having coronal portion with dimensions, 8-mm long × 5-mm in width, so that the 6-mm coronally extended post will be within the crown portion of the fabricated template. Utilizing this template, core buildup was done on decoronated teeth with postlength, 4 mm and 6 mm, which were then prepared for a metal-ceramic crown, such that 1 mm of the core structure is left incisally beyond the postlength of 4 mm and 6 mm. The two samples with preparations done were then utilized for fabrication of the second matrix. Now, this second matrix was used for the fabrication of core buildup on the decoronated teeth mounted on acrylic resin block. The core buildup was done with incremental layer by seating the matrix onto the postcemented into the decoronated teeth mounted in acrylic resin block. It was followed by light polymerization for 30 s on each surface (labial, palatal, mesial, and distal) resulting in a 2-min light polymerization cycle, thus achieving the coronal portion of the tooth. Similarly, core buildup was carried out for 160 samples. Then, the samples were stored in 100% relative humid environment at a constant temperature of 37°C for 72 h. After 2 weeks, samples were subjected to mechanical testing. The right-angled triangular brass device was made such that the base of triangle forms an inclined surface of 135° to the right angle. On the base of a triangular device, a hollow cube shape of dimensions, 20 mm × 20 mm × 20 mm, was created in order to assimilate the similar dimensions of acrylic resin blocks with mounted teeth. When the samples were placed in the brass mold, the mounted teeth in blocks will be in consonance with the angle of the brass mold, i.e., 135°, thus standardizing the position of overall samples in the brass mold. To retrieve the acrylic resin block from the brass mold, an Allen-Wrench key mechanism was introduced, which was perpendicular to the inclined surface [Figure 2]. 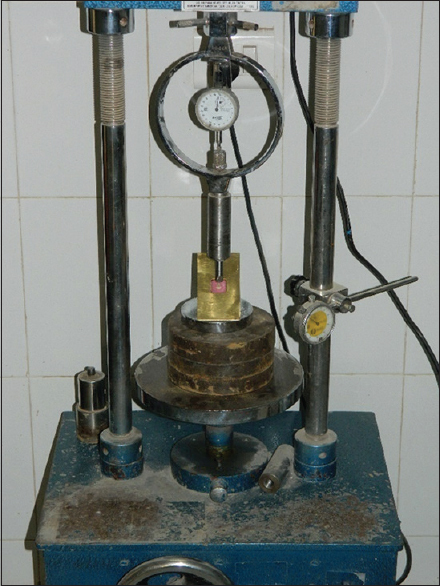 After placing an acrylic resin block with decoronated teeth mounted on acrylic resin block in the right-angled triangular mold, which was introduced to the universal testing machine (Calibrated Force Machine, National Physical Laboratory, New Delhi). Now, the load is applied perpendicularly on to the palatal surface 4 mm down the incisal edge cervically, thus standardizing the entire protocol and achieving the proposed research. A crosshead speed of 1.25 mm/min was applied until the moment of fracture occurred of the core or post. Later, statistical analyses were performed. Data collected were tabulated and analyzed using the Statistical Package for the Social Sciences software Version 17 for Windows (SPSS Inc., Chicago, IL, USA). Results were expressed as percentage and mean with standard deviation. The variables were assessed by using the one-way ANOVA and an independent group Student's t- test [Figure 3]. A comparative study was carried out for an evaluation of fracture resistance of coronal extension for two different dowel materials with two different lengths restored with core. A total of 160 samples were fabricated. They were divided into two main groups, namely Group A (glass fiber post) and Group B (Quartz fiber post). Each sample was tested for fracture resistance by using the universal testing machine at a crosshead speed of 1.25 mm/min. [Table 1] shows the division of samples into four groups according to two types of postmaterial and coronal extension of post with 4 mm and 6 mm in length. The Group A1 with glass fiber post with 4 mm of coronal extension, A2 with glass fiber post with 6 mm of coronal extension, B1 with Quartz fiber post with 4 mm of coronal extension, and B2 with Quartz fiber post with 6 mm of coronal extension into forty samples each. [Table 2] shows the mean value and standard deviation of the Group B1 (Quartz fiber post of 4 mm) and Group B2 (Quartz fiber post of 6 mm). The mean scores infer that Group B1 has statistically significant higher value (P < 0.001) with a mean value of 314 N and standard deviation of 82.18 in comparison to Group B2 with a mean value of 160 N and standard deviation of 18.12. [Table 3] shows the mean value and standard deviation of Group A1 (Glass fiber post of 4 mm) and Group B1 (Quartz fiber post of 4 mm). The mean scores infer that Group B1 has statistically significant) higher value (P < 0.001) with a mean value of 314 N and standard deviation of 82.18 in comparison to Group A1 with a mean value of 182.8 N and standard deviation of 25.13. [Table 4] shows mean value and standard deviation of the Group A2 (glass fiber post of 6 mm) and Group B2 (Quartz fiber post of 6 mm). The mean scores infer that Group B2 has statistically significant value (P < 0.01) with a mean value of 160 N and standard deviation of 18.12 in comparison to Group B2 with a mean value of 124.1 N and standard deviation of 27.41. [Table 5] reflects the application of one-way ANOVA test for comparison of mean values for maximum fracture resistance to oblique force mean between and within the groups (glass fiber post of 4 mm, glass fiber post of 6 mm, Quartz fiber post of 4 mm, and Quartz fiber of 6 mm). P < 0.000 showed the comparison to be highly significant. When fracture resistance of Quartz fiber post with coronal extension of 4 mm and 6 mm in length to oblique forces was compared, it showed that Group B1 (Quartz fiber post with 4 mm of coronal extension) showed higher fracture resistance when compared with Group B2 (Quartz fiber post with 6 mm of coronal extension). When compared, fracture resistance of glass fiber post and Quartz fiber post with coronal extension of 4 mm in length to oblique forces, results showed that the Group B1 (Quartz fiber post with 4 mm of coronal extension) showed higher fracture resistance when compared with Group A1 (glass fiber post with 4 mm of coronal extension). 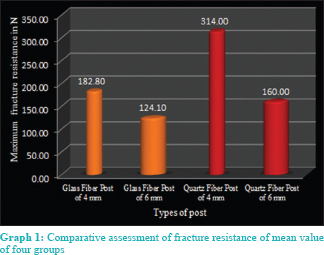 During comparative assessment of fracture resistance of glass fiber post and Quartz fiber post with coronal extension of 6 mm in length to oblique forces, results showed that the Group B2 (Quartz fiber post with 6 mm of coronal extension) showed higher fracture resistance when compared with Group A2 (glass fiber post with 6 mm of coronal extension). [Graph 1] depicts the comparative assessment of fracture resistance of glass fiber post and Quartz fiber post with coronal extension of 4 mm and 6 mm in length to oblique forces. Results showed that the Group B1 (Quartz fiber post with 4 mm of coronal extension) showed higher fracture resistance when compared with other Groups A1 with glass fiber post with 4 mm of coronal extension, B2 with Quartz fiber post with 6 mm of coronal extension, and A2 with glass fiber post with 6 mm of coronal extension. Fracture resistance is of greater importance than retention because the post can be recemented if dislodged from the tooth. However, if the root fractures, the tooth is invariably lost. Many factors have been attributed for the decrease in the fracture resistance of endodontically treated teeth. They are tooth structure loss, loss of free unbound water from the lumen and dentinal tubules, age-induced changes in the dentine, reduced level of proprioception, effect of endodontic irrigant and medicament on dentine, and effect of bacterial interaction with dentine substrate. Coronal destruction from dental caries, previous restorations/fracture, and endodontic access preparations are considered to be the main causes. Therefore, many authors emphasize conserving the bulk of dentine to maintain the structural integrity of postendodontically restored teeth. An ideal post system should exhibit fracture resistance higher than the average masticatory forces. There exists a definite correlation between postmaterial and fracture of roots. Endodontically treated teeth mostly require prosthetic treatment that had suffered previous trauma, restoration, or other endodontic interventions. Such treatment procedures may require a usage of post and core systems. Dowels have been advocated to strengthen weakened endodontically treated teeth against intraoral forces by distributing torquing forces within the radicular dentin to supporting tissue along their roots. Several post systems are available such as custom-cast posts utilizing materials such as gold and titanium, for prefabricated posts systems include stainless steel, titanium, and titanium alloys, gold plated brass, and ceramic and fiber-reinforced polymer materials. In the current study, the fracture resistances were evaluated for 160 samples (80 glass fiber posts, 80 Quartz fiber posts) with lengths 4 mm and 6 mm of coronal extension using the universal testing machine. After the fracture analysis for all the samples, mean values obtained were evaluated and comparison was done. The availability of 2 mm of original coronal tooth structure cervical to the core enabling to prepare ferrule can enhance the fracture resistance. The derived results revealed that the fracture resistance of Quartz fiber post of 4 mm has a mean of 314 N and glass fiber post of 4 mm has a mean of 182.8 N. The Quartz fiber post of 6 mm has a mean of 160 N and glass fiber post of 6 mm has a mean of 124.1 N. The results were found to be highly significant. The results revealed that Quartz fiber post with 4 mm coronal extension (Group B1) had higher fracture resistance than other groups. It was interesting to find that the variations in fracture resistance to different coronal extension of postlength were significantly evident. The results also revealed that the variation was significantly evident for different dowel materials. The mean of Quartz fiber post of 4 mm was found to be statistically highly significant compared to other groups. Similar study done by Miguel AIP et al, where quartz fiber had higher resistance as compared to glass fiber post. From this study, it was observed that there is a significant difference in two different types of postmaterial with different types of lengths for coronal extension. Galhano reported that Quartz fiber posts were stronger than glass fiber posts; several dentists still use glass fiber posts due to its reasonable price. Cast posts and cores are commonly advocated for teeth with little remaining coronal structure or for uniradicular teeth with small coronal volume. In such situations, the use of an alloy with high gold content, and thus high biocompatibility, high corrosion resistance, and low rigidity, appears most appropriate. Thus, the cast gold post and core have been regarded as the “gold standard” in post-and-core restorations due to its superior success rate. Alternatives to cast posts and cores have been developed. Base metal alloys had been used, but their disadvantage is hardness and may predispose the tooth to root fracture. Its major disadvantage being of unesthetic, requires a two-step procedure. For this to overcome, prefabricated post systems came into existence. In prefabricated fiber post systems, fiber content usually ranges from about 35% to 65%, with a higher fiber content post typically having greater strength and stiffness. The fibers are bound with resin such as epoxy or polyester resins and their advantages are metal free,, aesthetic in nature, and can easily be retrieved in case of endodontic failure. Carbon fiber post was the first generation of fiber-based posts introduced by Duret et al. in 1990 which was made of stretched aligned carbon fibers embedded in an epoxy-resin matrix. The extensive disadvantage of it was of its dark color, a major obstacle for esthetic restoration. Thus, esthetic requirements were fulfilled with the developments of tooth-colored Quartz- and glass-fiber posts. Glass-fiber posts, introduced in 1992, have unidirectional glass fibers embedded in a resin matrix that strengthens the post without compromising the modulus of elasticity. Glass fiber posts can be made of different types of glasses. Electrical glass (E-glass) is the most commonly used glass type, in which the amorphous phase is a mixture of SiO2, CaO, B2O3, Al2O3, and some other oxides of alkali metals. S-glass (high-strength glass) is also amorphous but differs in composition. In addition, glass fiber posts can also be made of Quartz fibers. Quartz is pure silica in crystallized form. It is an inert material with a low coefficient of thermal expansion. Purton studied the fracture resistance of teeth restored with a composite post and carbon-fiber posts and reported that tooth fractures were uncommon and that the most frequent site of failure was the post and core interface. It was demonstrated that roots restored with cast posts exhibited significantly higher internal stresses than prefabricated posts. There has been an increase in the retention of post with the advances in the bonding mechanism of composite resin to dentin., Core fabrication using composite resin is a feasible technique for restoring endodontically treated teeth. Fracture of composite resin core beyond the limits of normal masticatory forces protects the dowel along with the supporting root from further fracture. Most of the previous researches have focused on the intraradicular extension of the dowel with different materials at varied lengths.,, As there is limited scientific evidence related to length required for coronal extension of the post to resist the maximum oblique force. The present study was thus aimed to evaluate the fracture resistance of two different coronal extensions with two different post materials to obliquely directed forces. The extension of coronal tooth structure provides the greatest influence in terms of resistance and retention form for a crown. Limitations associated are as usage of microfilled composite for core buildup in the study. Hence, other composites could have been used, and further evaluation needs to be carried out. Similarly, other post systems could have also been considered, as limited post systems have been used in the study. Limited sample size affecting the predictability of the results, parameters like placement of ferrule and crown should also have been considered. Tapering posts were not considered for the study. Aging of these post systems was not considered, and long-term study needs to be carried out. Being an in vitro study, which did not replicate oral conditions, a single oblique load-to-fracture was used to test the fracture resistance of endodontically treated teeth. On comparison of maximum mean fracture resistance to oblique force, it was remarkably higher for Group B1 than Groups A1, A2, and B2. This result may be attributed due to the coronal extension of 4 mm. Giovani AR, Vansan LP, de Sousa Neto MD, Paulino SM.In vitro fracture resistance of glass-fiber and cast metal posts with different lengths. J Prosthet Dent 2009;101:183-8. Amarnath GS, Swetha MU, Muddugangadhar BC, Sonika R, Garg A, Rao TR, et al. Effect of post material and length on fracture resistance of endodontically treated premolars: An in vitro study. J Int Oral Health 2015;7:22-8. Sulaiman E, Alarami N, Wong YI, Lee WH, Al-Haddad A. The effect of fiber post location on fracture resistance of endodontically treated maxillary premolars. Dent Med Probl 2018;55:275-9. Nissan J, Dmitry Y, Assif D. The use of reinforced composite resin cement as compensation for reduced post length. J Prosthet Dent 2001;86:304-8. Haralur SB, Al Ahmari MA, AlQarni SA, Althobati MK. The effect of intraradicular multiple fiber and cast posts on the fracture resistance of endodontically treated teeth with wide root canals. Biomed Res Int 2018;2018:1671498. Olcay K, Ataoglu H, Belli S. Evaluation of related factors in the failure of endodontically treated teeth: A cross-sectional study. J Endod 2018;44:38-45. Iglesia-Puig MA, Arellano-Cabornero A. Fiber-reinforced post and core adapted to a previous metal ceramic crown. J Prosthet Dent 2004;91:191-4. Maslamani M, Khalaf M, Mitra AK. Association of quality of coronal filling with the outcome of endodontic treatment: A follow-up study. Dent J (Basel) 2017;5. pii: E5. McLaren JD, McLaren CI, Yaman P, Bin-Shuwaish MS, Dennison JD, McDonald NJ, et al. The effect of post type and length on the fracture resistance of endodontically treated teeth. J Prosthet Dent 2009;101:174-82. Fráter M, Forster A, Jantyik Á, Braunitzer G, Nagy K, Grandini S, et al. In vitro fracture resistance of premolar teeth restored with fibre-reinforced composite posts using a single or a multi-post technique. Aust Endod J 2017;43:16-22. Marchionatti AM, Wandscher VF, Rippe MP, Kaizer OB, Valandro LF. Clinical performance and failure modes of pulpless teeth restored with posts: A systematic review. Braz Oral Res 2017;31:e64. Ibrahim AM, Richards LC, Berekally TL. Effect of remaining tooth structure on the fracture resistance of endodontically-treated maxillary premolars: An in vitro study. J Prosthet Dent 2016;115:290-5. Malquarti G, Berruet RG, Bois D. Prosthetic use of carbon fiber-reinforced epoxy resin for esthetic crowns and fixed partial dentures. J Prosthet Dent 1990;63:251-7. Ferrari M, Vichi A, Grandini S, Goracci C. Efficacy of a self-curing adhesive-resin cement system on luting glass-fiber posts into root canals: An SEM investigation. Int J Prosthodont 2001;14:543-9. Clavijo VG, Reis JM, Kabbach W, Silva AL, Oliveira Junior OB, Andrade MF, et al. Fracture strength of flared bovine roots restored with different intraradicular posts. J Appl Oral Sci 2009;17:574-8. McDonald AV, King PA, Setchell DJ.In vitro study to compare impact fracture resistance of intact root-treated teeth. Int Endod J 1990;23:304-12. Purton DG, Payne JA. Comparison of carbon fiber and stainless steel root canal posts. Quintessence Int 1996;27:93-7. Ezzatollah J, Maryam M.In vitro evaluation of the effect of different diameters of quartz fiber posts on fracture resistance of dental roots. Rev Clín Pesq Odontol 2009;5:29-36. Cheung W. A review of the management of endodontically treated teeth. Post, core and the final restoration. J Am Dent Assoc 2005;136:611-9. Fraga RC, Chaves BT, Mello GS, Siqueira JF Jr. Fracture resistance of endodontically treated roots after restoration. J Oral Rehabil 1998;25:809-13. Galhano GA, Valandro LF, de Melo RM, Scotti R, Bottino MA. Evaluation of the flexural strength of carbon fiber-, quartz fiber-, and glass fiber-based posts. J Endod 2005;31:209-11. Heydecke G, Butz F, Hussein A, Strub JR. Fracture strength after dynamic loading of endodontically treated teeth restored with different post-and-core systems. J Prosthet Dent 2002;87:438-45. Duret B, Reynaud M, Duret F. New concept of coronoradicular reconstruction: The composipost. Chir Dent Fr 1990;60:131-41. Shetty T, Sudhagar Bhat G, Shetty P. Aesthetic postmaterials. J Indian Prosthodont Soc 2005;5:122-5. Usumez A, Cobankara FK, Ozturk N, Eskitascioglu G, Belli S. Microleakage of endodontically treated teeth with different dowel systems. J Prosthet Dent 2004;92:163-9. Lassila LV, Tanner J, Le Bell AM, Narva K, Vallittu PK. Flexural properties of fiber reinforced root canal posts. Dent Mater 2004;20:29-36. Assif D, Oren E, Marshak BL, Aviv I. Photoelastic analysis of stress transfer by endodontically treated teeth to the supporting structure using different restorative techniques. J Prosthet Dent 1989;61:535-43. Pereira JR, de Ornelas F, Conti PC, do Valle AL. Effect of a crown ferrule on the fracture resistance of endodontically treated teeth restored with prefabricated posts. J Prosthet Dent 2006;95:50-4.